My dad has always loved black licorice; I have always not loved black licorice. This worked out great when we would have jelly beans, as Daddy would always eat the black ones. He & I have a lot in common, but not this one thing. One thing we do have in common is that we are impossible to buy gifts for. I generally request “no gifts” for this reason; my dad does too. But Daddy is turning 67 this November and, well, I want to give him something while we are both here & of sound mind. (I am talking about me, btw–he’ll live for years, mind intact. Me? Not so sure about that.) At some point yesterday, the idea of making black licorice dawned on me. Spray an 8×8 pan with Pam or whatever you use. Set it aside. Put 1 1/3 cups sugar, 1 c Karo syrup, 2/3 c butter and 2/3 of a can of Eagle brand milk into a saucepan. Stir. Turn on the heat and keep stirring. Clip on your candy thermometer and cook and stir until you get to 232 degrees. Remove from heat when you get to that magic number. (Obviously, I could not take any pictures, BECAUSE I WAS STIRRING! Sorry to shout. I’m just not one of those take a million pictures every 10 seconds bloggers). Now, put in about 1 1/2 teaspoons of anise flavoring and black food coloring. WTF?? You ask. Where the hell am I gonna get black food coloring? Well, you probably aren’t, so do what I did: buy the multi-colored pack of food coloring and slop it all together. I mixed red, blue and green and got a black color! Sweeeeet! Now, pour the black mixture into your pan and let it sit. When it hardens, slice it into pieces. * The anise flavoring was overpowered by the butter. So, I dabbed some anise onto a paper towel and blotted it on the tops of the candy. It enhanced the “licorice” flavor and tasted more like how I wanted it to. * Is this what licorice is supposed to taste like? If so, it’s f’in awesome! The characters in the Matrix raised a similar question, wondering if the Ro-Bots had gotten the taste of their cereal right. Take cream cheese for example…I love Philadelphia Cream Cheese too (mmmmm, on a bagel with lox, please!) but it isn’t what cream cheese is supposed to taste like. *If, for some ungodly reason, you sat down and nommed the entire pan, you would consume 2,720 calories. You’d need to do about 6 hours of Jazzercize to burn it all off…but it might be worth it. Actually, modern licorice is a wheat-based product; what you made sounds much more interesting! Does your dad like beer? If you can find it, you should get him a six of Bell’s 9000. Super stout and very licorice-y. My dad shared one with me but I don’t like licorice the flavor was overpowering. I didn’t appreciate it like he will and he’s aging his six until the winter. You made licorice? Impressive! 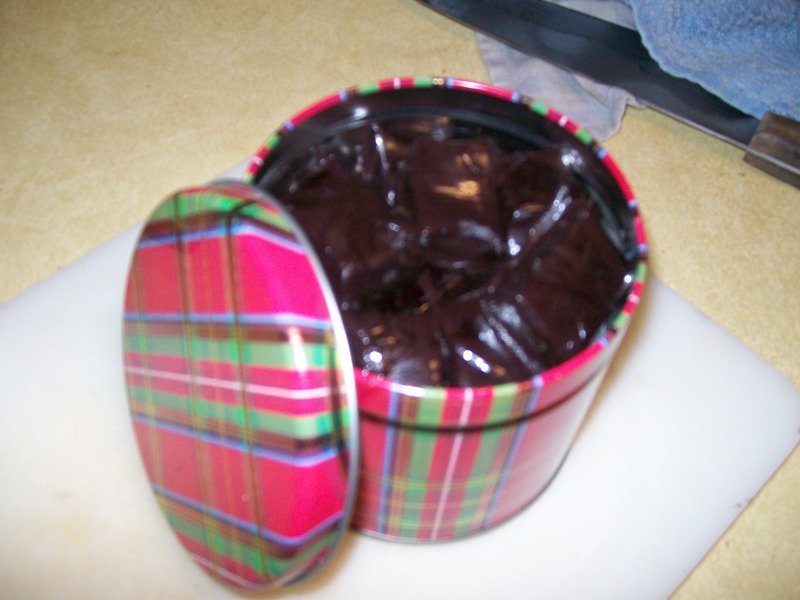 And this reminds me that I bought some licorice to send my dad for father’s day, but it still sits on my counter (I did send him something else, so i’m not a total slacker daughter!). Well, they must put a SHITLOAD of preservatives in the store bought stuff because this stuff goes gooey very quickly. So I put it in the fridge and it got like a rock. Then I took it out and it was gooey in a minute. It does make me wonder what the store stuff has in it…. Cool recipe! My mom and I are the same way about black jelly beans–I avoid them and she loves them. I should give this a try for her birthday. BTW Micheal’s and Meijer both have black gel food coloring. It comes in the little jars from Wilton. It’s very handy for making Bionicle fondant. You know, I thought about going to Michael’s but then I was like, “If they don’t have it, I’m going to be irritated b/c I hate going into that store”. Thanx for the tip! Mmmmm… I love black licorice. I’m impressed! Making things as gifts for the ones you love is just perfect. I make homemade ? for my clients and loved ones each year during the holidays, in ’08 I did marshmallows, and last year it was butterscotch sauce. Delish. I made garlic scape pesto to give my Dad for Father’s Day; he finished it this afternoon over angel hair and loved it. Oh look, I even commented on it before, but I totally forgot you had done this ! For what it’s worth, you can find black food coloring right above the anise extract at Busch’s. I was surprised! I didn’t buy any, though – it was a big bottle and cost $4, which was too much for this one-time event. We’ll either take your approach of using all the colors we have, or go with the au naturel coloration.